Students at Durham College (DC) know ‘success matters’. High school students embraced DC’s official motto as they attended the Centre for Success’s (CFS) celebration ceremony Jan. 17. CFS is a collaboration between DC and four school boards – the Durham public and Catholic boards and the Peterborough, Victoria, Northumberland and Clarington Catholic District School Board and the Kawartha Pine Ridge District School Board. Students in the program face unique life challenges and pursue a different route to their Ontario Secondary School Diploma than traditional high school, while also earning a college credit. “They walk like college students, they think like college students, and they’re basically treated like college students,” says Robert Wager, the director of the CFS. Most of the third floor of the new Centre For Collaborative Education building is home to classes for CFS students, including a room where students can get breakfast and lunch during school hours. Students are given a U-Pass, Wager says, since many of them bus to DC, as well as access to campus services and recreation facilities. 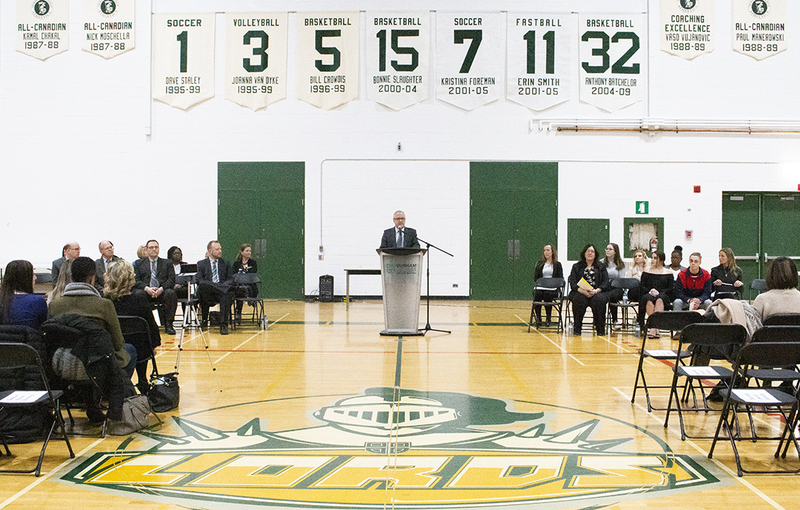 The ceremony for CFS students was held in Gyms 1 and 2, with families and friends supporting the graduates in a ceremony that resembled a convocation for college students. A student from each school board made speeches attesting to the positive impact the CFS has had, and will continue to have, on their lives. “I personally believe many of the students within the program would say how glad they were to have been offered this opportunity,” Madison Dorgan told the audience. Dorgan adds she started in the winter semester at DC in the 911 Emergency and Call Centre Communications program, which she says she couldn’t have achieved without the CFS. Each speaker thanked staff and teachers involved in CFS. “The only reason I did this is because of the support staff,” says Dorgan. The support staff from her high school, Holy Trinity, told her about the program, she says. Students can be self-recommended for the program or by high school faculty and must attend an interview to be accepted. Students then attend DC four days a week, with one day dedicated to a dual credit college course, either in General Education or Skilled Trades. Wager says the success rate for student completion is high. Of the nearly 200 students that enter the program in each semester, there is a 93 per cent success rate, he says. Wager says students have tremendous qualities they didn’t recognize in themselves before the program. “(The students) are the bravest of the brave, as far as I can see,” he says.